Koh Samui’s natural beauty and swathes of white sand beaches attract travelers looking to rest and relax. But there’s also plenty of offer for the style savvy LGBT+ visitor, as it’s home to some stunning and innovative resorts, each with their own distinct personality. There’s something for all tastes: those who like the quirky and whimsical; nature lovers, and even art admirers. This chic, minimalist property scores high on the design stakes. With tasteful use of a monochrome color palette and carefully selected objects that reflect Thai culture in the most inobstrusive manner, designer Tirawan Songsawat has created a peaceful and harmonious space that’s ideal for escapists. Indeed, the property describes itself as a blank page upon which guests can write their own stories. But that’s not to say it lacks character: the blood-red pool and beautifully curated artworks that pepper the hotel are spectacles in their own right. Bringing a touch of Miami to the island, this resort is designed with a clean and crisp aesthetic, based around a whitewashed colour scheme. This is accented with use of natural materials that tie the resort to its location on Chaweng beach: think bamboo, rattan, rope and polished driftwood. Each room in set in a futuristic arch, providing an elegant frame for the ocean outside. Nestled among the palm trees and lush forests, this secluded and tranquil resort is a sanctuary and an escape. The foliage is integrated seamlessly into all common areas, providing privacy and a feeling of oneness with nature, reflected in the use of local wood and natural material sin the interior design. The ‘Secret Garden’ spa takes this to the next level, emphasising the link between the healing power of plants for body and mind. This resort defies the laws of gravity with its villas resting on stilts high above a hilltop overlooking the Gulf of Thailand. Not only are these futuristic lodgings spectacular in their own right, they also allow uninterrupted, floor-to-ceiling views of the azure ocean from each room, blending in to the infinity pool on each villa’s deck. 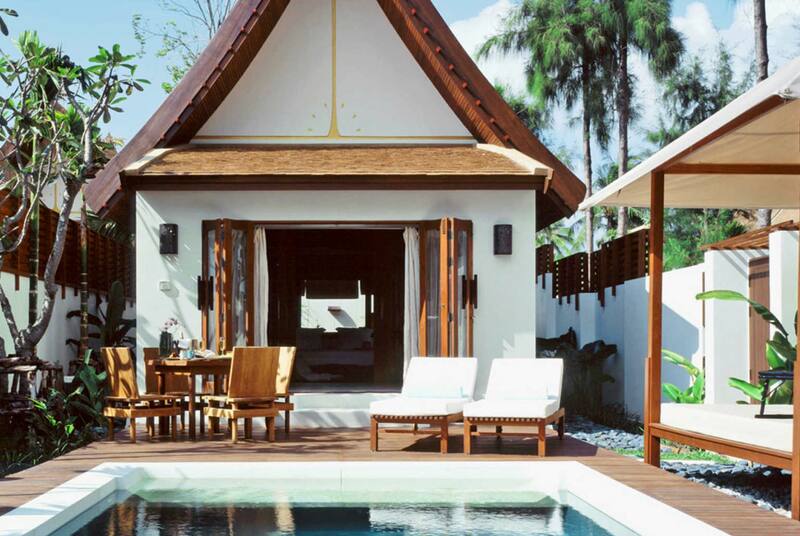 Elsewhere in the resort, East seamlessly meets West with Thai carved wood and white marble features. This lively resort is a fun and fabulous alternative to the classic, understated resort scene. Pops of color are everywhere: from vibrant lime greens, to hot pinks, to rich ruby reds. More muted tones are also used as backdrops for eye-catching pop art, and playful twists like interactive digital floors and giant chess sets. The in-pool WOOBAR is spectacular, with its infinity views over the ocean and cosy sunken pod design. 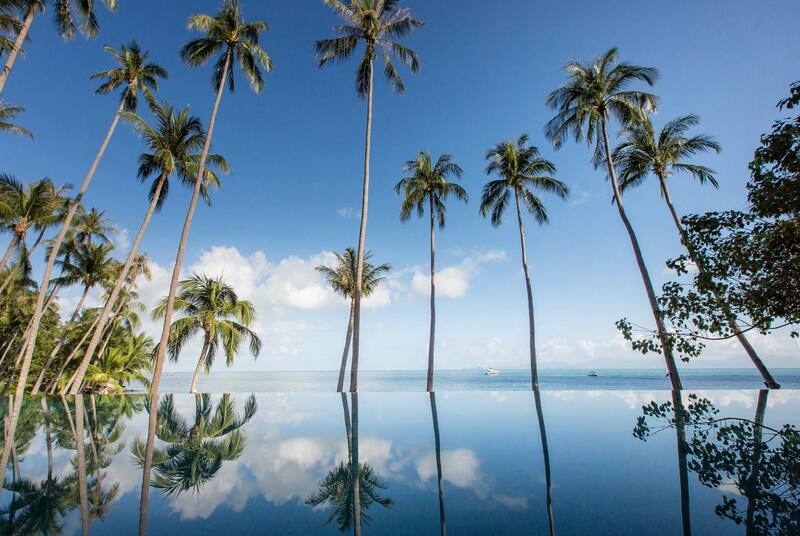 Despite the extravagant design, it by no means skimps on luxury credentials, with all 74 villas featuring private plunge pools and the brand’s innovative WHATEVER/WHENEVER concierge service.